FCC Approves Net Neutrality Rules For 'Open Internet' : The Two-Way The FCC approved the policy known as net neutrality by a 3-2 vote, with FCC Chairman Tom Wheeler saying the agency will ensure that no entity "should control free open access to the Internet." The Open Internet Order helps to decide an essential question about how the Internet works, requiring service providers to be a neutral gateway instead of handling different types of Internet traffic in different ways — and at different costs. "Today is a red-letter day," Wheeler said Thursday. The dissenting votes came from Michael O'Rielly and Ajit Pai, Republicans who warned that the FCC was overstepping its authority and interfering in commerce to solve a problem that doesn't exist. They also complained that the measure's 300-plus pages weren't publicly released or openly debated. The new policy would replace a prior version adopted in 2010 — but that was put on hold following a legal challenge by Verizon. The U.S. Court of Appeals for the D.C. Circuit ruled last year that the FCC did not have sufficient regulatory power over broadband. After that ruling, the FCC looked at ways to reclassify broadband to gain broader regulatory powers. It will now treat Internet service providers as carriers under Title II of the Telecommunications Act, which regulates services as public utilities. "This is a victory for free speech, plain and simple. Americans use the Internet not just to work and play, but to discuss politics and learn about the world around them. The FCC has a critical role to play in protecting citizens' ability to see what they want and say what they want online, without interference. Title II provides the firmest possible foundation for such protections. We are still sifting through the full details of the new rules, but the main point is that the Internet, the primary place where Americans exercise their right to free expression, remains open to all voices and points of view." "The FCC's decision to impose obsolete telephone-era regulations on the high-speed Internet is one giant step backwards for America's broadband networks and everyone who depends upon them. These 'Title II' rules go far beyond protecting the Open Internet, launching a costly and destructive era of government micromanagement that will discourage private investment in new networks and slow down the breakneck innovation that is the soul of the Internet today." "The landmark open Internet protections that we adopted today," Wheeler says, should reassure consumers, businesses and investors. Speaking at a news conference after the vote, Wheeler says the new policy will "ban blocking, ban throttling, and ban paid-prioritization fast lanes," adding that "for the first time, open Internet rules will be fully applicable to mobile." 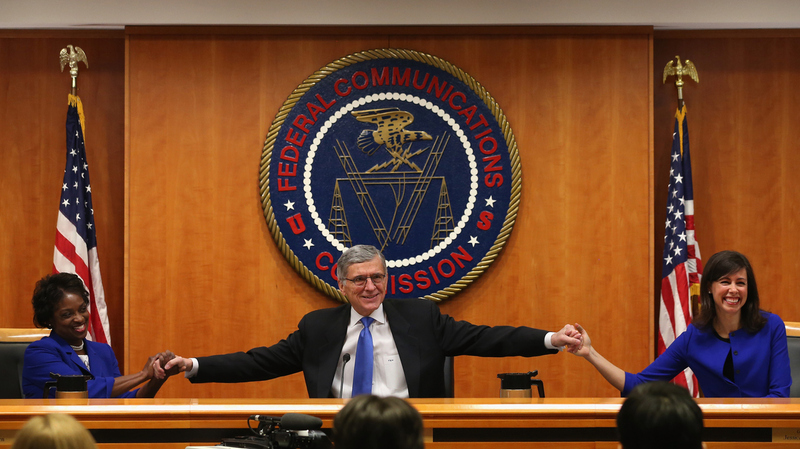 By a 3-2 vote, the FCC votes to adopt net neutrality rules to "protect the open Internet." Chairman Tom Wheeler is speaking, meaning a vote is looming. "The action that we take today is an irrefutable reflection of the principle that no one — whether government or corporate — should control free open access to the Internet," FCC Chairman Tom Wheeler said, drawing applause and whoops of approval from some of those in attendance. Saying the FCC was seizing power in "a radical departure" from its earlier policies. Commissioner Ajut Pai, a Republican, spoke against the proposal. He accused the FCC of "turning its back on Internet freedom." Pai said the commissioners were backing the new measure for only one reason: "because President Obama told us to." Seeing the new policy as an attempt to intrude on the Internet, Pai predicted higher costs for consumers and less innovation by businesses. After dealing with another issue (of municipalities being able to control broadband service), the FCC has turned to the new proposal. The proposal was introduced at Thursday's meeting by Julie Veach, chief of the FCC's Wireline Competition Bureau, who said it "would set forth clear, sustainable, enforceable rules to preserve and protect the open Internet as a place for innovation and free expression." She said the order "builds on the views of some 4 million Americans" who responded to a request for comments. Guest speakers included Etsy CEO Chad Dickerson and writer and TV producer Veena Sud, whose show The Killing survived with the help of Netflix. A short video from Tim Berners-Lee was also shown. Precise terms and details of the policy have not been made publicly available — a situation that prompted two Republican FCC commissioners to seek to postpone Thursday's vote. That request was denied. Summarizing "What You Need To Know" about the vote, Eyder wrote for the Two-Way, "Without net neutrality rules, ISPs could theoretically take money from companies like Netflix or Amazon to speed up traffic to their sites." Thursday's vote comes after Commissioners Michael O'Rielly and Ajut Pai asked that the FCC "immediately release the 332-page Internet regulation plan publicly and allow the American people a reasonable period of not less than 30 days to carefully study it." That request was denied; we'll post the document here when it's available.